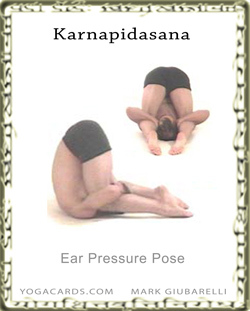 This is another popular yoga posture that is done in combination with a shoulderstand sequence. Karnapidasana sequences very well with Urdhva Mukha Paschimottasana Yoganidrasana and Halasana above. It is also good to do a variation that is half way between this pose and Halasana. This can be done by simply bending on knee beside the ear instead of both. A side version of this yoga posture can also be performed by simple placing both knees over to one side of the head. Make sure the neck muscles are properly stretched before entering this pose.